Developed by Sanyo in 2005, Sanyo Eneloop is the World’s most recognisable Rechargeable Batteries. 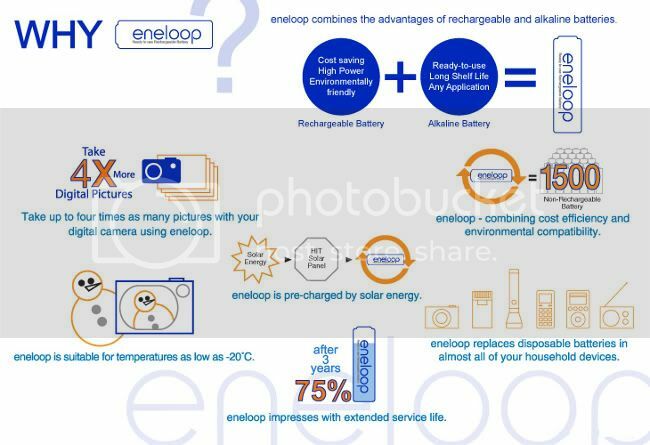 Sanyo Eneloop batteries combine the strengths of disposable and rechargeable batteries into a single product that is Ready to use, Rechargeable and possesses a long storage life. -Low self-discharge- Can store for YEARS and still be used without charging. -1,500 cycle life – Equivalent to purchasing 1,500 pieces of ordinary batteries!!! -Environmentally friendly – Reduce wastes to the environment!